Energy & Sustainability Club and i-MBA are organizing the 6th Energy Conference on “Energy – Investments – Technology: Seeking a new growth model”. The Conference will take place on Thursday, April 27th, 2017 (17:00 – 21:00), at the Royal Olympic Hotel (28-34 Athanasiou Diakou 28-34 Str., 117 43, Athens). The topics that will be covered this year include current trends on the design of energy markets, the modern financing methods in energy, with emphasis in sustainable development, the new technologies in power generation and energy management along with the best practices in energy projects development and new growth models in the energy sector in Greece. - George Daniolos, Managing Director, Heron Thermoelectric S.A.
- Ioannis Margaris, Vice Chairman, Hellenic Electricity Distribution Network Operator S.A. The conference will be attended by business executives, entrepreneurs, policy makers, diplomats, academics and researchers from energy, construction, shipping and innovation sectors. The attendance in this event is free of charge. Please note that seats are limited, so you are advised to register at your earliest convenience at https://goo.gl/NemlPO. The conference is sponsored by Norton Rose Fulbright and General Electric Power Services Hellas.It is also kindly supported by the Hellenic Association of Energy Economics, the Greek Energy Forum and the Alumni Association of the MBA International program. Media Sponsors: Nostus Communications and Events, www.energypress.gr, www.newsbomb.gr, www.epixeiro.gr, www.energyworld.gr, and www.insider.gr. Helena Stamou, Vice Chairman, Energy & Sustainability Club – Managing Director, Nostus Communications & Events. 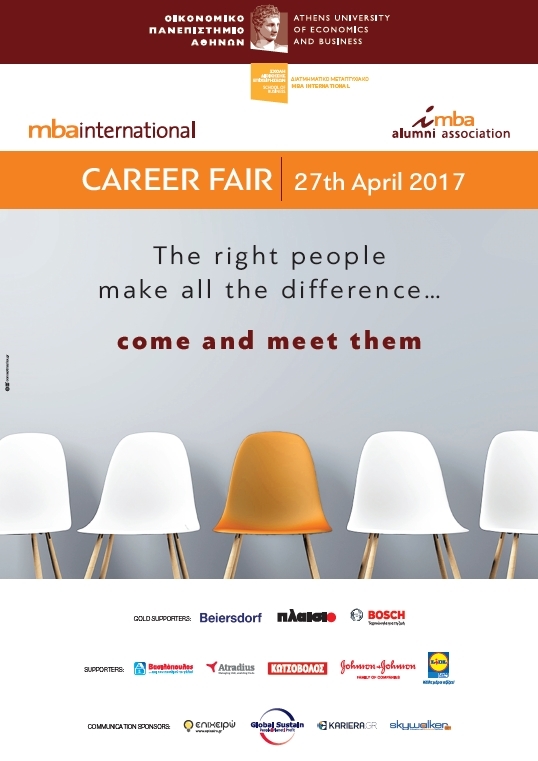 We are pleased to inform you that the MBA International program and the i-MBA Alumni Association are jointly organizing the 14th annual i-MBA Career Fair on Thursday, 27th April 2017,10.00 am to 7.00 pm (“Olympia” hall, Royal Olympic Hotel, Athens). For the last 13 years, the i-MBA Career Fair brings together under the same roof experienced professionals and entry level talented individuals with some of the biggest multinational and Greek companies. With strong and diverse academic and professional background and skills that are instilled at the program’s curriculum (leadership skills, strategic thinking, international exposure, ability to leverage technology and achieve high level results, etc), our students and alumni fulfill the diverse needs of companies of all sectors, and have proven to be a strong asset for them. This year the number of participating candidates will range from 100-120, while about 40 companies will be there to recruit them. Participation is open exclusively to i-MBA students and alumni. The following companies are the Gold Supporters of the event: Beiersdorf Hellas S.A., Plaisio Computers S.A., Robert Bosch S.A. The event is also supported by AB Vassilopoulos S.A., Atradius Crédito y Caución S.A. de Seguros y Reaseguros-Hellenic branch, Dixons South-East Europe AEVE, Johnson & Johnson Hellas Consumer S.A., Lidl Hellas & SIA Ο.Ε., and is kindly communicated by epixeiro.gr, Global Sustain, kariera.gr and skywalker.gr. Our Association organizes a working day after-work casual cocktail gathering. Our Association sponsors the Energy & Sustainability Club & MBA International 4th Energy Congress.